Spawn was one of the cornerstones of comics in the 1990s. Not only did it prove that comics could be a lot more mature, but it also launched Image Comics as a viable publisher. Image Comics and Todd McFarlane Productions are pleased to announce that the entire 250-issue library of Spawn, the classic series created by Image Comics co-founder and President Todd McFarlane, is now available in digital format for the first time ever. Spawn will be available to fans on comiXology.com, iBooks, Google Play, and imagecomics.com. Spawn #250 marks a huge milestone for McFarlane, who first released Spawn #1 in 1992. Spawn is one of the longest running independent comic books in history and now fans can immerse themselves in 23 years and 250 issues of Spawn with the simple swipe of a fingertip. And as if the long-awaited digital release of one of the most beloved creator-owned comics series wasn’t enough to thrill fans, comiXology will offer exclusive bundling—for a limited time—providing Spawn fans with an easy, discounted opportunity to enjoy the whole collection. Included with each bundle purchase is exclusive content from issue #250 featuring behind-the-scenes material that is not available anywhere else in digital or print format. 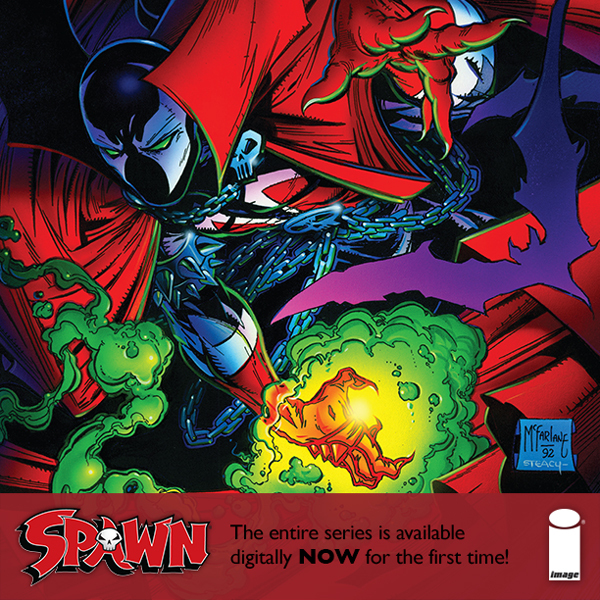 Image Comics and Todd McFarlane Productions are pleased to announce that the entire 250-issue library of SPAWN, the classic series created by Image Comics co-founder and President Todd McFarlane, is now available in digital format for the first time ever. SPAWN will be available to fans on comiXology.com, iBooks, Google Play, and imagecomics.com.